Windows can't open your file? Do you search for the right program that opens that file? our popular and free File-Extensions.org Search utility. To help you easily find the information about file extensions that you are looking for, we created a free simple utility that offers you quick access to the File-Extensions.org database and its associated software directly from your Windows or Windows Explorer. Easily find the information about any file extension you are looking for and its associated program(s) able to open it. Search directly for extension information from a simple Windows dialog window. or by a new option in Windows shell-context menu by clicking the right mouse button on any file. Simple enable or disable visibility of file extensions in entire Windows system. Auto-update function when a new version will be available. 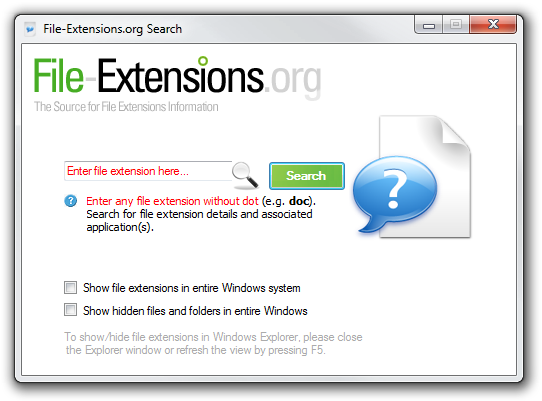 Learn more about File-Extensions.org Search application and its features. Any computer compatible with Microsoft Windows 8, Windows 7, Windows Vista or Windows XP SP3 with .NET Framework.